The HP W2448HC may be one of the most expensive monitors around, but from the moment you start to unpack it you see why, as HP has pulled out all the stops with this 24-inch TFT display. The large, black and silver monitor comes on its own integrated stand that allows for a fair degree of flexibility. You can view it in landscape or portrait mode and, due to the Z-shape angling of the stand, you can pitch the screen to the perfect eye-level for you. However, you will need to follow the set-up instructions strictly, as deviating can result in the monitor toppling over. The 24-inch screen has an optimum resolution of 1920 x 1200 pixels, but we found the scaling, when used with a range of laptops and netbooks, to be the most effective of any monitor. 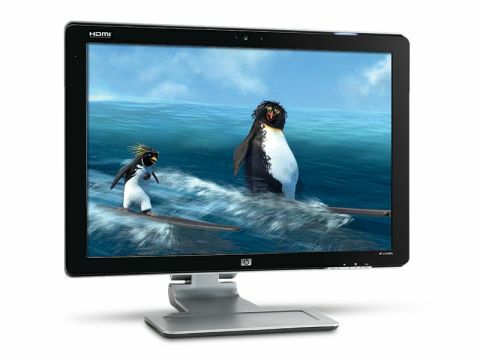 As you would expect of a high-end product, setting this monitor up is easy, as it automatically syncs with your laptop. With a range of connections, including HDMI, DVI and VGA ports located on the base of the unit, you can add both analogue and digital sources with ease. With a brightness level of 400 cd/m2 and a contrast ratio of 1000:1, this monitor has excellent colour range. The result is an amazing picture quality, whether it's watching movies or running tasks that require colour precision, and we found the HP more than lived up to expectations. What's more, this screen comes with a host of extras, so you'll find two USB ports included, along with a built-in webcam. To make the most of all of the features on offer, you'll need to install the included software on your laptop or netbook, but this only adds to the overall quality offered by the screen. There's no denying that the HP W2448HC looks and feels like the height of luxury. Sure, you have to pay for its cutting-edge design and features, but we feel the money is well spent and this is simply the best-looking, best-performing screen in its class.